My home office has been in a sad state of neglect since we moved into this home 8 months ago. Since I spend a good portion of my day in the room, working and creating my blog.... I've finally had enough! So I've put my design thinking cap on, and I've come up with a plan. And I wanted to join in the Where I Blog party over at Centsational Girl, so I hope you all will be interested in my plans for this room. First I wanted to show you my inspiration room. 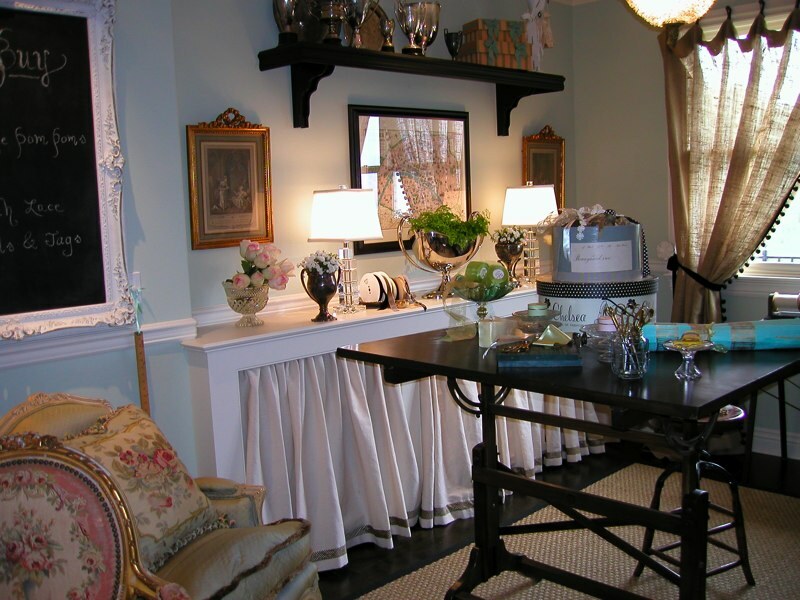 This is actually a craft room designed by Lulu Pom Interiors. I've had this room in my memory ever since I saw it in Mary Engelbreit's Home Companion magazine (may it rest in peace) two years ago. So I decided that I was going to use it as a jumping off point for my home office design. But first, let me tell you about my constraints. We rent this house. That means that the paint color and carpet remain. Next, my office is in the lower level of our house, and has no windows...that makes it a little dark...something I need to find a solution for. Last, I have little to no budget. That means that I have to be extra creative as I attempt to make the space a happy place to work. That said, I had to come up with a work surface. Well, two actually, since we have two computers. 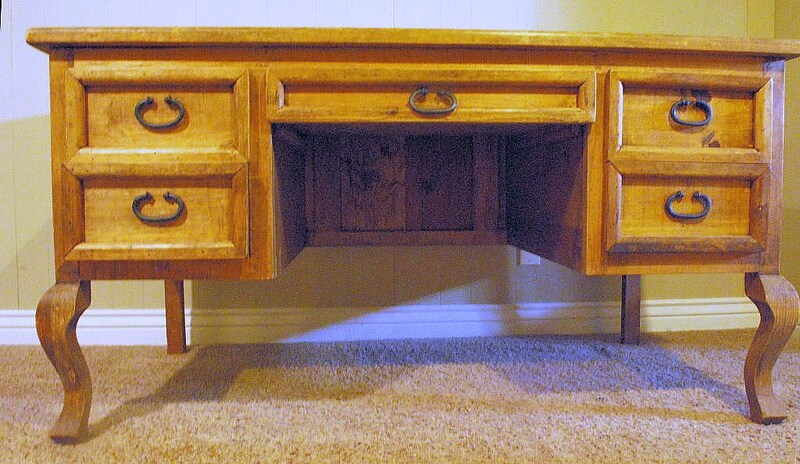 I will be using this desk, which is the companion piece to my rehabbed console. It has gorgeous lines and lots of storage, but a HORRIBLE finish. Next, I'll be using the little table that we used in our last house, pictured here in my built in desk cubby (This is where I used to blog...oh, how I miss my pretty little built in) with a fabric skirting. In keeping with the finishes in my inspiration room, I am going to paint both pieces white. I am also planning on skirting the small table with a linen skirt to hide ugly hard drives etc. from view. And I might possibly skirt the larger desk for the same reason...if I can do it without making it look silly...that remains to be seen. For seating, I'm actually planning on going modern. 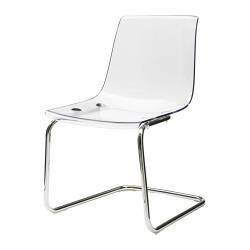 What I'd really love are 2 of these lucite chairs from IKEA. But they are $99 each, and I have no budget, remember? So I'm going to have to find something else. 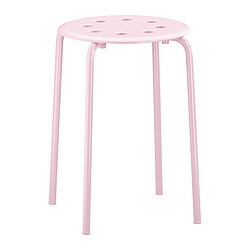 But I *am* going to pick up a few of these cute IKEA stools for the kiddos. $5.99 each is a steal! I really like the pink (maybe I'll get one in pink for the Princess...and maybe even one for me) but I think the boys would prefer the black. And finally, to add some light, I'd really love a chandelier. I like this one from IKEA...although it would have to be converted to a plug-in. 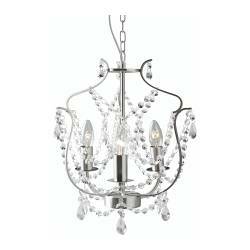 It's a great price at $39.99, but maybe I can find a great vintage chandy for less. That remains to be seen. I'll keep you posted on my progress as I go. Right now, both the desk and the table have coats of white primer. Hopefully, they'll have their final coats of paint by tomorrow! Keep your fingers crossed. And one last reminder...you have until midnight tonight to enter the Silhouette giveaway. The winner will be announced tomorrow. Wow Wend,... I am excited for you!! What great ideas. It is gunna be cute and classy, and so you. :) Maybe it will be finished enough for me to see it in October??!! All of those spaces are wonderful, I truly love your inspiration photo, the medley of blue, white and black. Your little office nook is perfect ! I can see how you miss it. I can't wait to see what you do with that console desk, that's a perfect place to log in plenty of online hours, and I love your idea for modern seating. Wow, I can see why you love that inspiration photo! It will be fun to see how you can transform your space into something you love equally as much! First of all your inspirational room is great, love the skirt on the mental I really love this type of creativity.. Your desk is although a bit old but I think when you colour it it turns to be great, White is obviously all time but you can go as for matching also.. like with the contrast what your walls colour, but I think the pestels colours are more suitable if you dont go for white.. I am waiting anxiously for the transformation and your the end result.. I love that inspiration space and can't wait to see the results! That's a very fancy craft room photo....so i can't wait to see your results. Not that i have any doubt you could totally go to town. Hello!! I just saw your note about wanting a "Moon" canvas. I want to send you one my friend....on me. Just email me your address, and I will stick it in the mail. I also want to advertise on your blog. I would love to take advantage of your special. Let's get rolling on this. Love your inspiration room! Here's just one humble suggestion... I noticed the table in the inspiration photo is black. Your desk might be pretty in black too, and since you can't paint the walls, this could give you some contrast. You could also have a piece of glass cut to top the desk, which would give it some shine and let you put a beautiful fabric, photos, whatever, underneath! Just a couple of ideas. I know it will be beautiful! Wendy, I have a closet that looks so similar to your own office space. As of now it is a junk closet but I can see doing it up as you did. Was it alot of work? I just love that! very cute. totally love the chandelier! I really love the desk it has so much potential! I just finished a redo of a sideboard with a similarly icky finish. My sister and I sanded it down and painted it in two tones of pretty green. I can't wait to see what you come up with! Your dream office will be lovely! That desk is quite amazing. And your blog cubby is adorable. This is a wonderful example that you truly can make a special space most anywhere. I'm looking forward to your new blog digs! Hi Lindsay...it wasn't too much work...but the hubby did most of it. (The one thing we had to do is sheetrock 2 of the walls inside the closet...which would probably not be necessary for you.) Then all we did was add the shelf at the top...and we were going to add a "shelf" for the desk surface, but my little table happened to fit perfectly inside the closet so we didn't need to. I was totally thinking what Sarah said when I saw the desk, though white will also be gorgeous. I would still be on the lookout for a piece of glass to put over it... it is such a gorgeous piece, you don't want any uh-ohs to ruin it. Good luck with your redo... can't wait to see the "next step" photos! I gasped when I saw the first picture thinking that was really your space - you would be one lucky girl! Gorgeous! A very full short crisp white skirt under and around the whole bottom of the desk and into the knee space would be gorgeous! I'd make it at least two and a half times the distance around the desk and similar to a crib skirt. Attached under the desk with velcro, it would be easy to remove for access to storage or wiring. Your desk is going to look so fresh painted white and those chairs from Ikea will look great. Love your blog! Looove the fabric skirts. So chic and pretty!